Airstream, in it’s splendid ingenuity inspires people to look at things differently! For example…. we get calls from people interested in buying Airstream coaches. What a wonderful idea! Perfect for some, for others … wow, talk about sticker shock! The new 2014’s sell for around $150k. Granted, it’s a beautiful, awesome vehicle and worth every penny ~ but that’s a large investment for something you may only use a few times a year. 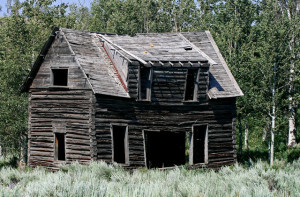 So, we jokingly checked online and found a cabin for sale on several acres in Montana. Ran some quick numbers, and realized: you could actually BUY that cabin and still have enough funds left over to rent our Airstream 5 times a year to go VISIT your cabin ~ all that for the cost of a brand new Airstream Interstate!!! Something to think about! We encourage all you would-be Airstreamers and dreamers to rent an Interstate! Not only might you still have enough cash left over to buy yourself a cute cabin, but you’ll be free from the hassles of storage, maintenance, depreciation, insurance, etc. as well.